Choosing the right and best airsoft brand for guns and gears can be challenging because hardly would you find one manufacturer that can offer you everything you may be looking for. Believe me, there are so many companies all over the globe, making Airsoft guns for the sport. While it may just be easier to close your eyes and randomly draw a brand name form a hat, this would not be the best approach in finding a suitable gun brand. Not all brands are created equal. Each brand has its strengths and weaknesses, but generally, you’d be looking for a high-quality airsoft gun that is durable, offers a decent feet per second (FPS), has a realistic look, and is relatively easy to upgrade. What are the best Airsoft brands? The simple answer is, there are many. When looking for the best Airsoft brands, you may have noticed that there exist many brands to choose from. Choosing one boils down to a number of things you’ll have to take into consideration. First, you have to take into account that there are three main qualities that make up a great Airsoft gun brand. Those three things are quality, reliability, and detail. Well, whether you’re a veteran or a beginner airsoft player, to save you hours of research, we decided to put together a series of reviews on the best brands out there to pick out the best airsoft brands in the market today. Let’s take a look at the best airsoft brands that you should be looking at when you make your next purchase, whether it be accessories, or your next pistol or rifle. ICS is a manufacturer of airsoft guns based in Taiwan and is in fact known as one of the biggest and reputable airsoft manufacturers out there. The company’s motto is “high innovation, high efficiency, and high quality” and they really don’t delve far from that principle. This company comes with over 30 years of history in creating weapons and accessories for the airsoft industry, and they are considered one of the first-class AEG manufacturers in the world. All this experience is seen in their products (guns, spare parts, and accessories) which are all around ideal for both beginners and professionals. ICS produces a wide range of pistols and rifles that copy real weapons to the smallest details. Their guns are popular among intermediate to experienced players and this brand is known to focus on innovative designs. They are also very well-developed in the accessories niche, and you can get ammunition, premium airsoft helmets, tracer units, chest rigs, and so on. Basically, you can get the best airsoft outfit from ICS without breaking the bank. Regarding performance, most their weapons are accurate and support around 360 to 390 FPS. This is due to premium internals and the use of metallic elements where it matters. Even more, their weapons are easy to maintain because it’s effortless to pull them apart. The other bonus to ICS weapons is that their upper gearbox can be disconnected from the weapon system, so as to allow easy upgrades or repairs to their guns. They feature outstanding prices, and the level of quality is always at the highest standards. Classic Army is a Hong Kong-based airsoft gun maker that has a reputation for being one of the best airsoft brands out there. This Airsoft company is known for its high-quality internals that won’t let you down when you are out on the battlefield. Classic Army lends itself well to the close quarter battle (CQB) players and produces weapons that are easy to maneuver in tighter quarters. CA produces its line of durable weapons constructed of both ABS and/or Metal. Even for ABS, we found the bodies to be solid and durable enough to hold up to the rigors of gameplay. CA gets high marks for their metal AEG’s and for good reason. Their metal AEG’s are not only durable, but highly detailed which lends to their realism and CA weapons are ultra-realistic, when compared to similar models manufactured by rival companies. The internals of the guns are good just like the externals and they come strong enough to withstand some beating out on the field. They are of great quality, feel good to handle and are generally one of the best airsoft brands available. When you want a high-quality AEG, with good internals, impressive performance, and plenty of power, your best brand is Classic Army. Overall, CA is a CQB player’s brand that produces durable airsoft weapons, that won’t let you down when the fight gets heated. A&K Airsoft is another solid airsoft gun brand that potential buyers should seriously consider when searching for a new device. A&K is considered to be a manufacturer that provides solid, easy-to-use products that center around performance and has been regarded for its Light Machine Guns AEG weapons. A&K does make plastic weapons but, they seem to favor all-metal construction for many of the weapons they produce. The internals on some of their weapons was regarded as hit or miss. Our take, if you are looking for an affordable all-metal weapon or a light machine gun, then this may be an option worth taking a risk on. Although A&K Airsoft focuses more on performance-based options, they have several options that are both solid and easy to use even for beginners. As a result, many people consider them as ideal for those just starting airsoft. A&K Airsoft focuses mostly on rifles, carbines as well as other forms of machine guns and the prices are low enough to give a user access to a plethora of options as well for the purpose of testing. The issue is with this brand is that while the majority of their systems are quality, there are some minute pieces that should be replaced in the weapon as they may be likely to break down quite easily. The prices vary from as little as $150 to as much as $350. If you’re willing to take the time to research though you might be able to find some of the higher priced options at a discount. Tokyo Marui is based out of Japan and when it comes to airsoft guns they are considered to be one of the best if not the best in the industry. The company is well known for creating superior designs of. Take their FAMAS F1 model for example which was the first automatic electric gun (AEG) ever made. Also, they introduced the hop-up system to the market. Their guns and parts are so good that most airsoft gun buyers will avoid any brand that is not compatible with Tokyo Marui parts. Airsoft guns that aren’t “Tokyo Marui compatible” are considered disadvantageous; this is the closest thing to the gold standard of compatibility, as non-Tokyo Marui compatible guns will be difficult to find replacement or custom parts for, especially magazines. The reason why Tokyo Marui works best for experienced players and skirmish style play is because their products tend to be on the expensive side of things. Their airsoft guns are designed with high manufacturing standards. Tokyo Marui models are typically metal exterior entirely or a mix of plastic and metal. In addition, users can easily modify their gearboxes to enhance performance while playing. Tokyo Marui is, of course, Japanese, which unfortunately gives them some disadvantages on the international airsoft market due to Japanese airsoft laws. They must use ABS plastic receivers, which means their guns are not officially “full metal” – a designation sought after by airsoft players looking for the highest quality, most authentic-looking guns to their real firearm counterparts. However, experienced players know that, while expensive, Tokyo Marui guns are the longest lasting and most reliable, and they make some of the best airsoft rifles on the market. For some of the best entry-level but surprisingly realistic looking airsoft guns out there, check out CYMA. CYMA is a budget and one of the best airsoft brands from China. This manufacturer produces affordable clones of high-end Airsoft replicas that is a mixture of metal and plastic, makes for a more durable replica without a lot of extra weight. Their airsoft AK line, while not high-end, still makes for a great budget-beginner replica weapon. The reason we feel this is important is because with metal it provides a better sense of durability. Plastic makes it so that the gun isn’t too heavy and also enables a user to have an easier time using the gun. CYMA has an interesting angle to their models, they tend to make guns that are a combination of metal and plastic. Metal parts gives the guns better durability while plastic makes them lighter and more portable. Even more, most CYMA products come with batteries and chargers, which make their weapons ready to use out of the box. It’s true; you won’t find the outstanding airsoft batteries in such a package, but it’s a good start. You can always save a bit more and buy yourself a high-quality airsoft LiPo battery to replace the stock one. CYMA is also in the market with accessories and parts, and I’m sure you appreciate the fact that their guns come ready to be used (with batteries and chargers). They may not always be the best in quality, but you can get in the game as soon as you have the gun. G&G rifles earns a spot on our list of best airsoft brands because they are known for quite some great benefits. Guay & Guay is a Taiwanese company manufactures some of the best Airsoft weapons that you can pick up. For instance, their guns rank high for performance, reliability, durability, and power straight out of the box. Their latest models now come stocked with tight bore barrels and high-performance V2 gearboxes. E.g. one of their models – G&G Combat Machine 16 Raider – remains one of the most commonly used airsoft rifles users buy now because of its impressive performance right out of the package. We wholeheartedly recommend the G&G M4 Combat Machine Raider (More on this Awesome M4 Here). While we really cannot complain about G&G weapons themselves, we feel that some of their accessories are just not manufactured to the same level of quality as their rifles. As a stock gun maker, their weapons are always highly accurate and perform very well straight out of the box. The combat machine series of airsoft guns is one of the most popular weapon systems you can see on the field and rightly so, it is a great system that allows players to perform very well in various game types and in different roles as well as remain a durable weapon through most of an airsofter’s career. With all these features, G&G have provided highly functioning, quality airsoft weapon systems to players. Their major contribution to the sport being their flagship product, the G&G Combat Machine which you would have no problem spotting on any airsoft field this day and age. AGM is another well-known maker of quality airsoft guns and they are based in China that teeters somewhere between being a budget brand and a performance brand. With AGM it is one or the other. Despite manufacturing some metal with real wood models, we consider them to be closer to the budget minded player that the all-out pro-player. Their guns offer users a mix between budget-level products and performance. Meaning, do you prefer affordability or performance as you may have to compromise on what you are looking for when you buy a particular model. AGM designs may be considered as unconventional when placed beside other brands. 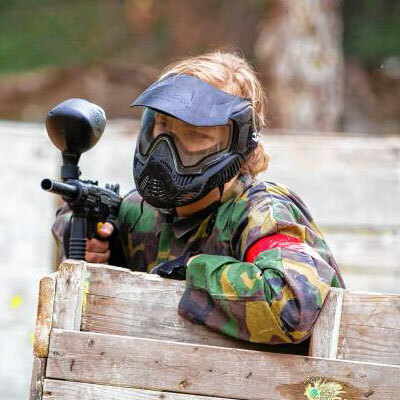 This is due to the very wide variety they offer such as high-powered pump action shotguns and powerful sniper rifles to the usual airsoft guns like machine pistols and rifles. The cheaper models are probably better suited for the backyard warrior or target plinker. We did find that AGM manufactures some unique weapons that are harder to find elsewhere. Some are beastly weapon choices (the Sturmgewehr 44 for example). Their WWII classics like the Sten MKII submachine gun, the StG44, and the MP40 are some great guns for those Airsofter’s into vintage arms or battle reenactment. The serious knock on them and the reason we feel they work best for intermediate play is because they tend to not be built to take rough game play and comes with a different, more diverse offer, but you should not buy on impulse. Note that though their guns are durable, they may not be suitable for very rough play compared to many other best airsoft brands. Straight out of Hong Kong, G&P manufactures products best suited for skirmish style play and for use by experienced players in terms of realism. G&P is a Hong Kong-based maker with. Their products are very military-style and they come with war-game products. Historically, this company has produced designs that lend themselves to being the perfect replica for as tactical training weapons. World Military’s, as well as law enforcement, still use G&P replicas for training or simulation. This company makes the list because it’s quality, design and realism are at a level superior to many airsoft manufacturers. If you are looking for close or medium range models, then G&P would be a good fit (but an expensive fit). Our only real gripe is that their selection of long-range options like sniper rifles are practically non-existent when compared to other brands. Note that they don’t offer many options when it comes to long-range sniper style rifles though they have an impressive range of grenade launcher attachments. Use their guns more for medium or close range play. G&P offers a multitude of standard airsoft guns such as electric, gas and difference shotgun options. On top of this you can also find a good selection of grenade launcher attachments. The only real knock against this company is that they don’t make a lot of weapons in terms of long range sniper options. If the goal is to play at ranges that are medium or close, then you’ll find G&P useful. FirePower is a brand of the CyberGun Company, which is one of the largest airsoft companies in this niche and has affordable airsoft products. CyberGun is a soft air gun company based in France, and their main activity is the design of replica weapons for sport, outdoor shooting, video games, and collectors. They own a broad range of brands, and their replicas cover lots of well-known names such as Smith & Wesson, Uzi, Sig Sauer, Kalashnikov or FirePower. Honestly, this is not the first brands to look for high-quality weapons, but their strength is in the multitude of products that fit the niche and low prices. FirePower is a cheap brand, but they do have some good entry-level products that fit most beginners. They don’t usually sell their weapons to the final buyer directly which is why you’ll find their airsoft guns on Amazon and most of the other online platforms dedicated to selling airsoft products. Regarding accessories, we would recommend them to most beginners, as you’ll find everything from the premium air soft eye protection to vests and knee pads. FirePower can help you put together the best equipment without spending a ton of money on protective gear. You’ll also find quality BBs, magazines, excellent optics, gas canisters, and super targets under this brand. They are present on almost any market and, in most cases, FirePower guns are cheap, but they support a hard plastic body and good inner workings, so you will have the necessary tools to learn your way into air soft practices. So, if you are a beginner looking for the leading air-soft guns under 50 dollars, FirePower is the right brand for you. Another Hong Kong-based maker, Jing Gong produces several good airsoft guns that are like less expensive versions of higher end brands. In particular, They are known for their rifles and SMG’s. Much like CYMA, JG weapons are also clones of high-end replicas like those produced by Tokyo Marui. However, though they are close replicas at a more affordable price, it doesn’t make them of less quality per se as their products can compete favourably with the high-end ones during play. Their SMG range and rifles are the most popular ones among the items they offer. One thing we want to emphasise is that users shouldn’t look at them as being a low budget knock off option. The majority of the airsoft guns and products they make are made with a high level of quality you wouldn’t expect, even with the low pricing. Finally, there are influencing factors that while are not brand related, they do figure into the equation. Typically these are the things that will usually vary from player to player. Factors such as personal likes/dislikes, wants/needs, affordability or expectations. We hope you have found this list of best airsoft brands helpful if you are considering new equipment to add to your repertoire. If you are on the search for the best airsoft gun, you might want to consider this list, which looks at the most reputable and best airsoft brands online. No matter what you decide, choosing from the brands we have listed above means you will hardly go wrong and you get to enjoy your airsoft gun for many years to come.